BACKGROUND AND PURPOSE: Histologic evidence of cortical tubers is pathognomonic of tuberous sclerosis (TS) disease. Cerebellar tubers, however, are uncommonly found. Our objective was to evaluate the prevalence and characteristics of cerebellar tubers in a large series of pediatric patients with TS studied with MR imaging. In particular, their relationship with volume loss and age will be analyzed. 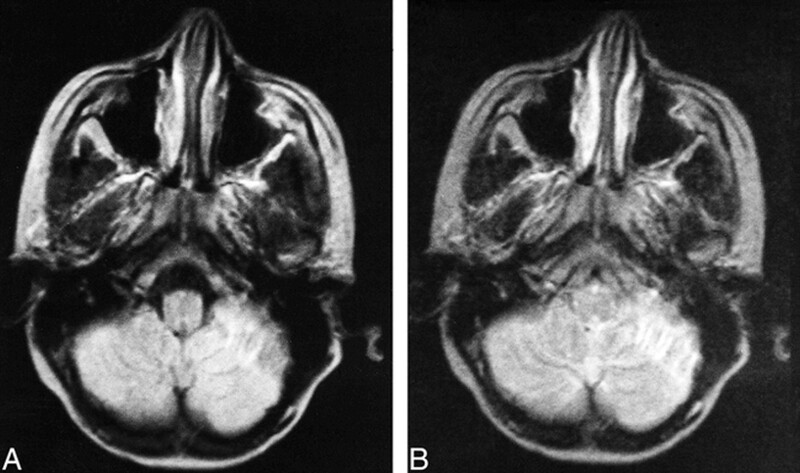 METHODS: MR images of 34 children with TS and cortical tubers were reviewed. There were 17 female and 17 male patients. The mean age was 8.9 ± 4.5 years (mean ± SD), with a range from 2 to 14 years. The number and location (supratentorial, infratentorial) of tubers and volume loss of the underlying parenchyma were recorded. The relationship between tuber location, patient age, and number of tubers was studied using the Student's t test for independent samples. The relationship between tuber location and presence of volume loss was established using the Pearson χ2 test. RESULTS: The mean number of cortical tubers was 14.3 ± 8.5. Fifteen (44.1%) patients had cerebellar tubers associated with cerebral lesions. Patients with cerebellar and cerebral tubers had significantly more global cortical lesions than did patients with isolated cerebral tubers (17.9 ± 8.9 versus 11.4 ± 7.2 tubers, P = .026). Patients with cerebellar tubers were significantly older than those with isolated supratentorial tubers (11.3 ± 3.4 versus 7.1 ± 4.4 years, P = .005). In only four (11.8%) patients were tubers associated with focal parenchymal volume loss. The tubers in all of these cases were located in the cerebellum—indicating a significant relationship with volume loss (Pearson χ2 test, P = .017). CONCLUSION: In this series, cerebellar tubers were frequent and were always present in association with cerebral cortical tubers. They were seen in older children with a larger total number of tubers. Cerebellar tubers may be associated with focal volume loss. Tuberous sclerosis (TS) is a congenital neurocutaneous syndrome with variable expression in multiple organs. The most frequently involved organs are the skin, brain, retina, lungs, heart, skeleton, and kidneys. In the brain, histologic evidence of cortical tubers is pathognomonic of the disease. The tubers are characterized by disruption of normal cortical lamination, replacement of some neurons by giant cells of bizarre shape, and increased number of astrocytic nuclei (1, 2). Cells in these tubers have a divergent glioneuronal differentiation (3). The radiologic confirmation of brain tubers is considered a secondary feature of the entity (4, 5). Tubers appear as cortical lesions that are hyperintense on proton density–weighted and T2-weighted images and hypointense on T1-weighted images (6–11). The increased signal intensity of cortical tubers often extends into the depths of the involved gyri and toward the deep white matter. The subcortical white matter close to the tubers usually shows hyperintense changes on proton density–and T2-weighted images because of gliosis and hypomyelination (1). Cerebral cortical tubers can expand the gyri. The appearance of cerebellar tubers is similar to that of their cerebral counterpart. We noticed, however, that cerebellar tubers were occasionally associated with focal volume loss and were present in older children (11). Our objective was to evaluate the prevalence and characteristics of cerebellar tubers in a large pediatric series of patients with TS. In particular, their relationship with volume loss and age is herein analyzed. MR images of 36 consecutive children with an established diagnosis of TS were retrospectively reviewed. For all patients, an evaluation was made of the presence and appearance of cortical cerebral and cerebellar tubers. Cortical tubers were encountered in 34 children. Therefore, two children without tubers were excluded from analysis. There were 17 female and 17 male patients. The mean age was 8.9 ± 4.5 years (mean ± SD), with a range from 2 to 14 years. MR studies were conducted in all cases with a 0.5-T superconductive magnet. Images were obtained in the sagittal plane with a spin-echo T1-weighted short-TR short-TE sequence (550/30/2 [TR/TE/excitations]) and in the transverse plane with a spin-echo proton density–weighted and T2-weighted double-echo sequence (2200–2500/50,100/2). Sometimes, additional short time inversion recovery (1500/100/44/2 [TR/TI/TE/excitations]), gradient-echo T2*-weighted (900/28/1 with 17°), and contrast-enhanced spin-echo T1-weighted (350/30/2) sequences were also obtained. In all sequences, the section thickness was 7 mm, with an acquisition matrix of 256 × 192. The number of tubers, location (supratentorial, infratentorial), and volume loss of the underlying parenchyma were recorded. Variables were read by two radiologists in consensus. The relationship between tuber location, patient age, and number of tubers was studied using the Student's t test for independent samples. When appropriate, data will be expressed as the mean ± SD. The relationship between tuber location and presence of volume loss was established using the Pearson χ2 test. Cortical tubers were clearly detected on proton density–and T2-weighted images as hyperintense lesions situated in the cortex of either the cerebrum or the cerebellum (Figs 1–3). Most of these lesions remained undetectable on the T1-weighted spin-echo sequences, unless they became very hypointense (four cases). In our series of 34 patients with brain tubers, 19 had isolated cerebral tubers (55.9%) and 15 had associated cerebellar tubers (44.1%). None of the patients had isolated cerebellar tubers. Images from the case of a 9-year-old male patient. A, Proton density–weighted transverse spin-echo MR image (2200/50/2) shows a right cerebellar tuber. B, T2-weighted transverse spin-echo MR image (2200/100/2). There were 30 cerebral tubers, seven subependymal nodules, and five white matter lesions. The total number of cortical tubers was highly variable between patients. The mean number of tubers was 14.3 ± 8.5, with a range from 1 to 30. Patients with cerebellar and cerebral tubers had more global cortical lesions than did patients with isolated cerebral tubers (17.9 ± 8.9 versus 11.4 ± 7.2 tubers). This difference was statistically significant (Student's t test, P = .026). Patients with cerebellar tubers were older than those with isolated supratentorial tubers (11.3 ± 3.4 versus 7.1 ± 4.4 years). The difference was statistically significant (Student's t test, P = .005). In only four patients were cortical tubers associated with parenchymal volume loss (Fig 3). In all of these cases, the tubers were located in the cerebellum. The relationship between cerebellar tubers and focal associated atrophy was statistically significant (Pearson χ2 test, P = .017). None of the supratentorial tubers had associated focal atrophy, whereas five cerebral cortical tubers had clear enlargement of the gyri. Cortical tubers are very frequently detected by MR imaging in patients with TS. Cortical tubers are hyperintense on proton density–weighted spin-echo, T2-weighted spin-echo, and short time inversion recovery images, remaining usually undetectable on short-TR/TE images (8, 9). In our series of 36 pediatric patients, 94.4% had brain tubers, a prevalence similar to those reported in other series (9, 12). Usually, tubers are located in the supratentorial cerebral parenchyma. Cerebellum lesions are less frequently found. We observed cerebellar tuberomas in 44.1% of our patients. In other series (7, 9, 10, 12), the frequency of cerebellar tubers was lower (between 12 and 15.8%). As in other reports (9, 12), isolatd cerebellar tubers were not found in our series. Therefore, isolated cerebellar involvement must be considered distinctly uncommon. In our series, patients with cerebellar tubers differ from those with isolated cerebral lesions. They seem to be always associated with supratentorial tubers. We also found that patients with cerebellar tubers have more brain tubers than patients with isolated cerebral lesions. The relationship between the number of brain tubers and the presence of cerebellar lesions has not been previously studied. Because the number of cortical tubers is a biomarker of neurologic severity of cerebral dysfunction, measured by seizure status and its control and by developmental status and level of mental retardation (13), patients with cortical tubers may have more severe cerebral disease. It is well known, however, that patients with a large number of tubers do not inevitably have poor mental development. Because our study was retrospective, no attempt was made to correlate tuber location with clinical symptoms. Additionally, patients with cerebellar tubers were older than those with isolated cerebral tubers. It is well known that TS has a variable pathologic expression in multiple organs, usually showing a chronological pattern of presentation. In this sense, cardiac rhabdomyoma detection is typically neonatal (14), the hypomelanotic maculas often occur before the age of 1 year, and renal involvement begins in infancy (15); however, ocular and other abdominal lesions are usually diagnosed when the patient is approximately 2 to 3 years of age. The association of cerebellar tubers and focal volume loss has been reported in the literature (9, 11). In our pediatric series, focal atrophy was associated with cerebellar tubers (Fig 3) but not with cerebral tubers. This volume loss is probably related to dense gliotic tissue of glial processes histologically seen between the cellular elements (2). It is also in this gliotic matrix where calcification occurs. As previously noted, cerebellar tubers had a great tendency to calcify (7, 11). 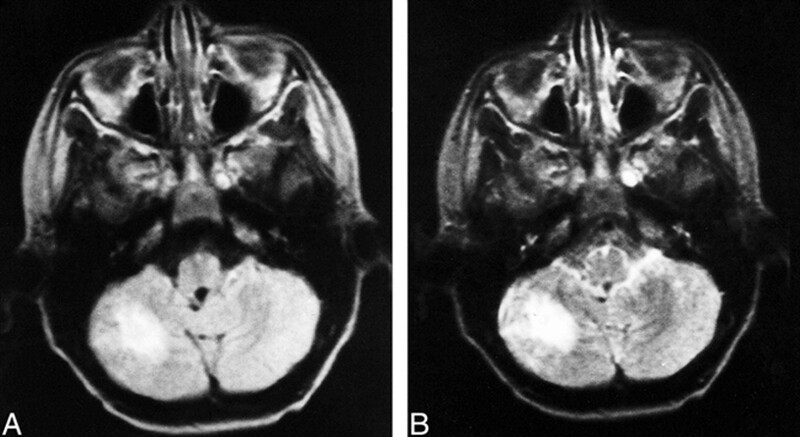 Therefore, gliosis of the cerebellar tubers must be related to both the calcification (Fig 2) and the atrophy (Fig 3) that is frequently observed in these lesions. Even more, necrosis, hemorrhage, and cellular degeneration within the tubers are exceptional. Images from the case of an 11-year-old female patient. A, Proton density–weighted transverse spin-echo MR image (2200/50/2) shows a left cerebellar tuber with hypointense inner lines from calcification. B, T2-weighted transverse spin-echo MR image (2200/100/2). There were 29 associated cerebral cortical tubers, three associated subependymal nodules, and six associated white matter nodules and lines. Images from the case of a 12-year-old male patient. A, Proton density–weighted transverse spin-echo MR image (2200/50/2) shows a left cerebellar tuber with volume loss of the underlying parenchyma. B, T2-weighted transverse spin-echo MR image (2200/100/2). C, Contrast-enhanced T1-weighted transverse spin-echo MR image (350/30/2). There were 13 cerebral cortical tubers, eight subependymal nodules, and one white matter nodule. In conclusion, cerebellar tubers are frequent findings (44.1% in our series) and they do not seem to occur in the absence of cerebral cortical tubers They occur in older children with a large total number of tubers. Cerebellar tubers may also be associated with focal cerebellar atrophy. 1 Address reprint requests to Luis Martí-Bonmatí, MD, Sección de Resonancia Magnética, Servicio de Radiodiagnóstico, Hospital Universitario Doctor Peset, E-46017 Valencia, Spain.